We’ve updated most of the app’s widgets to add some new features, along with the way modules are added to the thank you page to be consistent with the new Shopify changes. This also allowed us to update and improve our live preview, so here’s a summary of the new stuff you can start using immediately! The Facebook widget for Happy Checkout has been updated to allow for more flexibility in what’s displayed. 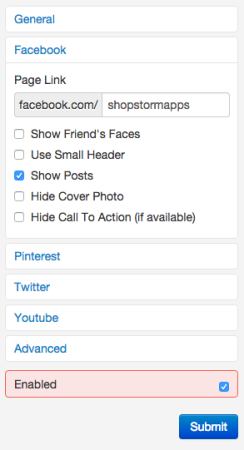 Previously, the Facebook widget would display your page’s name, like button, and posts. However, as Facebook has made some improvements to pages (such as Call to Actions), they’ve released a newer widget from their end that we can use to support this. We’ve updated our Facebook widget to use this, and now you can opt to show you page banner, show avatars from some of your page’s friends or people who’ve liked it, show or hide posts on your Facebook page, and swap out your Call to Action for a general “Share” button if desired. This gives you a much more flexible Facebook widget and a far better display on the thank you page. 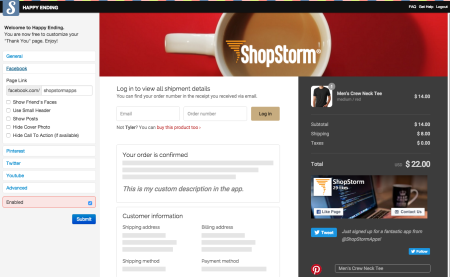 We know Pinterest is hugely popular and it’s a great driver of high-value orders, so we’ve tried to make it easier for your customers to follow you and pin purchased items. 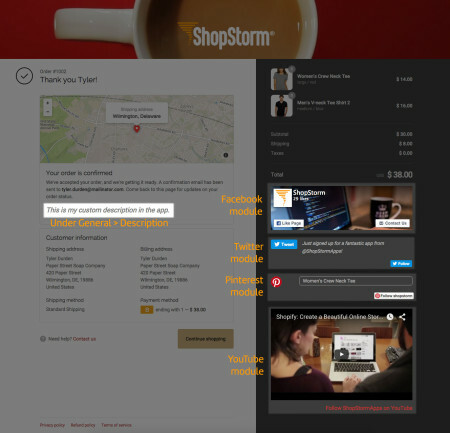 You can determine whether you want to use small or large “Pin it” buttons, along with the way the button looks. 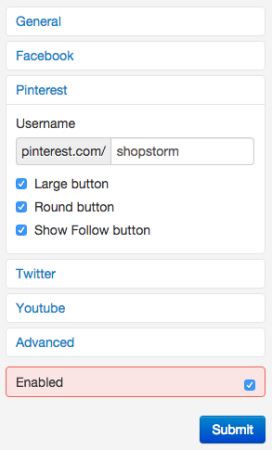 If you use the “round” button, you’ll use the circular Pinterest logo. If you use the default “Pin it!” button, you can select the color, along with whether to include the pinned count or not. You can also add the “Follow” button so customers can follow you on Pinterest in addition to pinning purchases. We’re really happy with the improved Twitter integration, which just started using Twitter’s new Tweet and Follow buttons. You can now enable following and sharing a tweet separately, so you can only show a “Follow” button if desired. 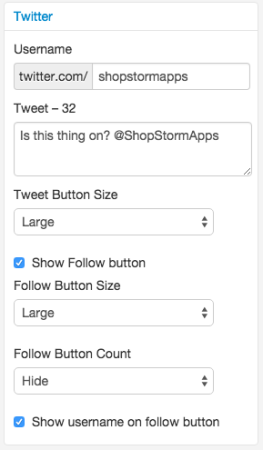 You can still write up a suggested tweet for customers to share, and can change the tweet button size (along the the follow button size). Follow buttons can optionally include your Twitter handle and / or your follower count. The new Twitter buttons are a vast design improvement as well, and will most likely blend in better with modern Shopify themes. The app’s “Live Preview” has gotten an update to pull real order data rather than trying to guess at the way the thank you page will look. Your preview will now pull in information from your shop’s last order, removing the need to view a “Live checkout” to get the full picture on what your changes will look like. As a result, we’ve made the live preview faster and more accurate so you can more easily see the changes you’re making to the thank you page. Have any questions about the updated app? We’d be happy to answer them in the comments!